For the past several years, my family and I have spent the first two weeks of the New Year skiing in various locations in Europe. This year, we chose the Italian Dolomites, famous among skiiers for its Sella Ronda region. We chose a ski resort in the village of Selva Val Gardena, one of the three villages that make up the valley known as Val Gardena. January 2017, single image, additional exposures for highlights, focal length 48mm, aperture f/11, shutter speed 25 seconds, ISO 64, tripod. This year, however, was different. For the first time that I can remember, there was no snow. There was artificial snow on the slopes, to be sure, (and the skiing was great) but the surrounding mountains were strangely snowless. Selva Val Gardena wasn’t any less lovely for lack of snow; it could be a picture postcard of an Alpine village. But there was nothing to indicate that this was ski resort in January — lovely as it was, it might just as easily have been the middle of summer. But as I had no control over the weather and I didn’t want to waste an opportunity for a great shot, I managed to slip away and get some fine sunrise and sunset shots. Even without snow, I found Selva Val Gardena to be an enchanting place. 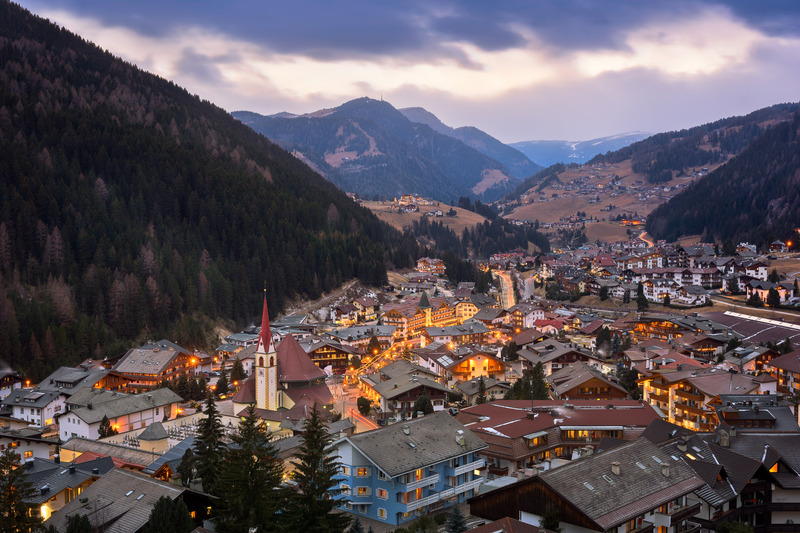 This entry was posted in City and tagged Dolomites, Italy, Val Gardena.